I was craving some whole fish and though in Kenya we mainly deep fry our fish before stewing, personally I prefer not to plus it is much healthier and still as tasty without the extra oil. I used tilapia for this recipe but you can easily use rock-cod, kingfish the choice is yours. Ask your fishmonger to scale and cut it for you in large chunks but if you want to practice removing the scales from the skin then, by all means, buy the fish whole and do it yourself at home. I prefer to have the fishmonger do it, saves me on time when it comes to preparing the dish. Fish recipes are often complex and are not suitable for fussy eaters. 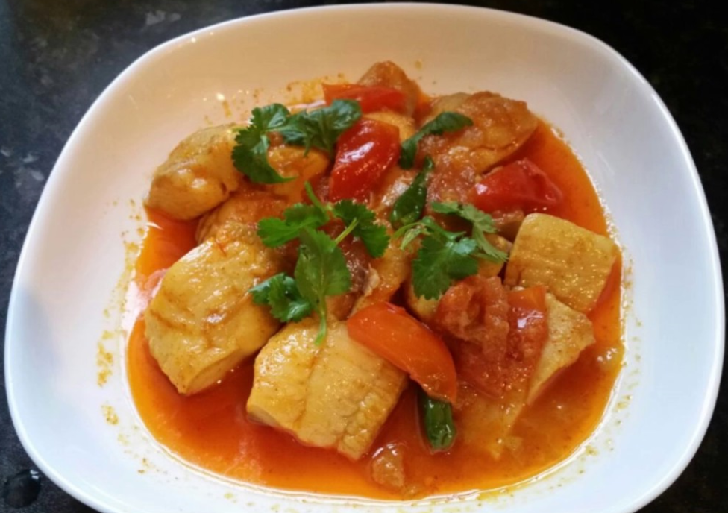 However, this delectable Fish Curry is not only simple to make, but it is also delicious – even the fussiest of eaters in your family will enjoy it! Follow the simple step-by-step recipe and you’re guaranteed a culinary treat. Heat oil in a saucepan and fry sliced onion and garlic. Add the tomato, curry powder, water, and green chilies, and simmer on a low heat for five minutes before adding the green pepper and potato. Simmer for 10 -15 minutes until potato is cooked through and add the fish fillet. Stir lightly, taking care not to break the fish. Cook slowly on a low heat for another five minutes. Garnish with cilantro and serve immediately with a side of rice or with ugali.